Having grown up watching her dad experimenting in the kitchen, Ellie Wharrad has always had a passion for pâtisserie, and after completing her A-Levels Ellie knew there was nothing else that she would rather do than follow her dream and undertake the Diplôme de Pâtisserie at Le Cordon Bleu London. 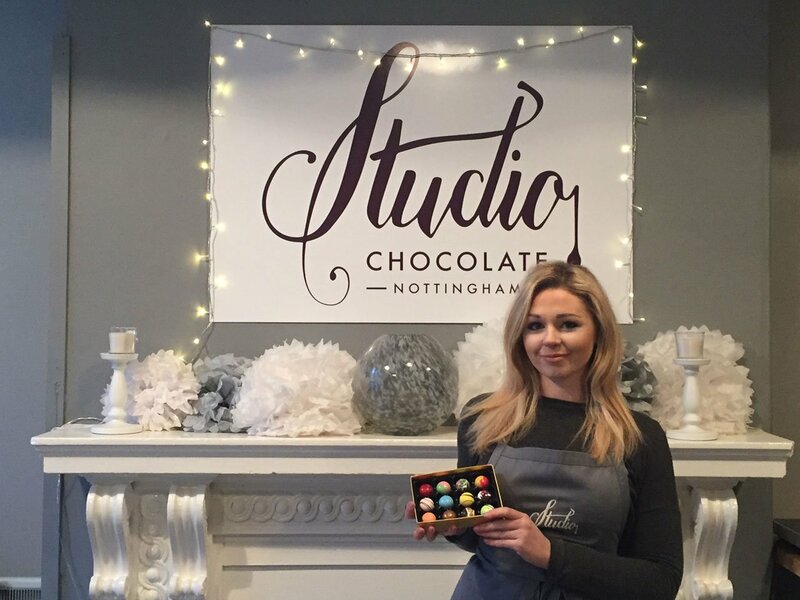 Now at the age of just 23, Ellie is the proud owner of a successful chocolate studio in Nottingham, which offers an array of artistic pâtisserie creations as well as services such as hen parties, children’s parties, corporate events and chocolate workshops. Ellie took some time out to speak to Le Cordon Bleu London about her time at the school and how her pâtisserie diploma has contributed to her success. Why did you choose to study the Diplôme de Pâtisserie at Le Cordon Bleu London? My love affair with pâtisserie began when I was about twelve or thirteen, when I started baking for my friends and family. I guess having a dad who was always in the kitchen, experimenting with his own recipes was an early inspiration for me as well. I have always loved cooking in general, but I was much more interested in pâtisserie as I had such a sweet tooth! So when it came to deciding what I wanted to do after having completed my A-Levels, Le Cordon Bleu was the obvious answer for me because there wasn't anything at university that I was remotely interested in studying. I knew that at Le Cordon Bleu London I would be able to invest my time doing something that I truly loved. What did you most enjoy about your experience whilst on the course? The thing that I most enjoyed whilst studying at Le Cordon Bleu London was definitely the Superior Pâtisserie Certificate. It was such a massive step upwards from the Intermediate Pâtisserie Certificate – not only in terms of the cooking techniques that we were taught, but also in regards to learning the business side of things. There was so much more work to do and it was much more intense, but I think that adrenaline rush is what this industry is all about. One of the main things that I valued about my time at Le Cordon Bleu London was the people that I met, and those that I was able to learn from. Learning all of the culinary techniques is obviously so important, but I think working with not only the Teaching Chefs but also the other students was such a massive part of it too. I loved the community that Le Cordon Bleu London had, and it’s so nice to still be in touch with the teaching staff and others that I met during my time at the school. It’s really great to be able to see what we have all achieved since graduating. I knew that at Le Cordon Bleu London I would be able to invest my time doing something that I truly loved. What did you do after graduating from Le Cordon Bleu London? After graduating from Le Cordon Bleu London, I was lucky enough to land a position in a Michelin-starred restaurant working as a stagier, and as much as I enjoyed the experience and learnt an incredible amount about food and the industry, I realised restaurant life just wasn't for me. The following November, my mum and I went on a trip to Belgium where we visited many different chocolate shops. This trip was a real eye-opener for me because I realised that the majority of the chocolates that we tasted were generally all brown and all very similar in terms of available flavours. After learning how versatile chocolate can be at Le Cordon Bleu, the lack of variation was quite disappointing for me and it was at that moment that I decided to create my own! Having an arty background, I came up with The Artist Collection, and as soon as I released it in November 2015, I knew it was the right direction for me. No-one had seen anything like it in Nottingham before, and I really loved creating it. The Artist Collection is a range of twelve hand painted chocolates, inspired by twelve different artists, from Van Gogh, which is passionfruit and white chocolate, painted yellow with dark chocolate piping to represent his sunflowers, to Banksy which is a 71% ganache, splattered with white and red, which I thought was very fitting considering Banksy is such a dark character. What made you decide to open Studio Chocolate and what is the concept behind it? Opening the studio in May 2016 was a massive step for me, and the main reason for doing this was due to the high volume of enquires that I was receiving about hen parties and corporate events. When I found the first floor studio I knew it was perfect – a beautifully bright room with an area for a shop. I wanted to set up a business on my own because I wanted the freedom of being able to create my own products. Studio Chocolate is a combination of my love for chocolate and my love for art, so it’s a very personal thing for me, and everything I create is thoroughly thought out and intricately hand-crafted. For example I have just brought out The Cosmic Collection which is inspired by the solar system, and includes Mars, the God of war, which I represent with a chilli ganache and a mango jam. I cannot wait for the next few months so that I can promote this new collection more, as it’s such an exciting theme. What has been you biggest challenge to date? The hardest part for me so far since opening Studio Chocolate, has been the last few months in the build up to Christmas. Trying to balance running a business, alongside being the only person making the chocolates has been really tough, physically and mentally! The hours have been incredibly long and there have been times when I’ve really doubted whether I could actually continue, but seeing how successful it’s become just in a few months is really overwhelming, and completely worth it - it helps to love what I do too! How do you think your Diplôme de Pâtisserie has contributed to your success? I learnt so much at Le Cordon Bleu London, such as various techniques in all areas of pastry, but mainly my Diplôme de Pâtisserie taught me that you should always do things properly, and never cut corners. I saw how much goes into every element of a dessert or pastry, and the difference the extra time and care makes. And that's why I've been able to have patience with the chocolates that I make at Studio Chocolate, as I know the end product will be completely worth it. What advice would you give to any budding chocolatiers? My advice to anyone thinking of setting up a business on your own is to make sure you genuinely love what you’re doing and don't let anything or anyone get in your way. Surround yourself with people who support you too as I couldn't have achieved all of this without the help of my family. From ribboning up boxes until 2am, to the moral support, and being there when I needed them, they have seriously helped me get to where I am today and I couldn’t be more thankful! If you would like more information about Ellie's chocolate business, please visit the Studio Chocolate website. For more information about the Diplôme de Pâtisserie that Ellie studied, please visit the page, or view our other programmes and courses.